One way link building is an important part of your overall SEO strategy. The major search engines view these as high quality inbound links - when done right. In this post I'll give you 7 simple one way link building strategies that give your Link Reputation a nice little boost, and also bring in highly targeted traffic all on their own. 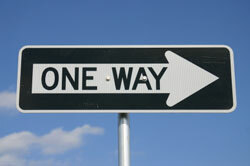 One Way Links are valuable because they are viewed as truer votes towards your web page. The exception is sponsored links, or one way links that are obviously purchased. There are a number of ways that Google can tell this, which is one of the reasons that a permanent inbound link tends to gain more weight over time. Interviews come in all shapes and sizes, and you can really get creative with this one. A traditional audio interview on a webinar, podcast or online radio show will usually get you a link on the host's site and also a mention to their mailing list (even better if those newsletters are archived online). I prefer text interviews on relevant blogs, as they give you a high quality contextual link from a relevant content page. This can be done by answering a series of questions via email that are then published on the blog. Another option is Q&A style, which is fun and easy. Interviews are great, but guest blogging is even better for one way link building. Why? Because as the author of the content on the page that is linking to your page, you have full control over that link. You can choose the keyword phrase to optimize the blog post, choose the page you want to link to that is relevant to that topic, and use your preferred anchor text in that backlink. And if that wasn't reason enough to start guest blogging, you're also putting yourself in front of an established readership in your niche! One thing you really want to stay away from is programs or schemes designed to create your one way links, or text link brokers that sell you one way links. These programs and brokers are really frowned upon by the major search engines and could hurt your Link Reputation rather than improving it. This being the case, I still purchase text links from time to time - I just do it smarter. And I never purchase a temporary link, but rather a permanent contextual inbound link on a relevant content page or blog post. How do I manage to do that? Simple: I offer bloggers a one-time payment to blog about a specific link on my site. Most of the "pay per post" brokers pay their bloggers $5-$15 for blog posts, so that price range is suitable - particularly for B-list or C-list bloggers. I usually use Job Boards on forums to make the offer. I do not specify anchor text, give them more than one page or blog post to choose from, and just request that they blog about the topic and link back to the page/post. I do this because I want link variation, and because I'm buying "advertising" or "buzz" - rather than specifically buying text links. Never use a broker. Do it yourself, or hire a virtual assistant to manage it. Period. Submitting articles to article directories is similar to guest blogging in that you have complete control over the content and the link. This is a great method that people have been using successfully for years. In addition to getting indirect rankings when your submitted article ranks well, and then funnels traffic into your site, your article can also get republished all over the web - resulting in numerous quality one way links. Republished here, here and here (to name a few). Most merchants won't publish a live outbound link to your site from their sales page, but if you get creative you might just be able to get a link from their blog or an internal page on their website pointing to your review or case study of their product. I'm actually seeing an example of this in the SERPs now with a page I'm trying to beat out for their #3 listing. By analyzing their backlinks, I discovered the merchant was linking to their review. Look for merchants that link out to reviews, give live links in testimonials, or that have blogs. If they have a blog you can offer a detailed case study or success story as a guest post, which includes the link to your review of their product. Meh. Good luck. But if you can manage to get a one way link by submitting and getting an approved listing in the DMOZ directory - go you! Ideally you should include social bookmarking buttons on your blog posts or web pages to encourage your readers to bookmark your content. This is the best and most natural way to get one way links from this source. You can also set up your own social bookmarking accounts, but my advice is that for every link of your own that you bookmark... you should bookmark 5 or 10 other links on domains or properties you do not own. This keeps it natural, and resourceful. 8. Bonus One Way Link Building Tip! Also See: How Many Backlinks Do I Need? 6 year waiting period LOLzzz. But I think its pure luck because some sites get indexed in a few weeks after submission and some keep trying for years yet don't get indexed. The thing that hurts most about Dmoz is that you never know if your site has been even reviewed or not and whether or when you should resubmit. BTW, The number 8 is the ultimate goal of every site that is what search engines love. The most effective way of natural link building but even if you have quality stuff your site it needs to be discovered that is why I like Article Marketing because it not only gives you one-way backlinks but also tons of traffic if done effectively. WooHoo! Thanks for the juice Lynn! I feel the buzz!! I also believe that #6 is very much out of our control and we have to do it once and wait for months. So, it won't be a good method. I would recommend press release marketing, specially with the services that link your keywords back to your web pages. Submitting to DMOZ is still a good method. Why would you NOT take a few minutes to do the submission, regardless of the wait or the results? Press Releases are a great method for one-way links IF you have something newsworthy to share in a release. Joe Marsh has a really great (fast) method for this. I agree with you on the importance of taking one single step that could repay enormously - I mean submission to DMOZ! Yet, in the bigger picture, I still believe that I will allocate just one row in my list of the on-going link building campaign strategies despite its true value. The rest will mainly be allocated to one-way links specially from the most relevant sites or at least sections of a site. Please take this as a slightly different idea as I highly appreciate your post. Sure. No doubt about it! DMOZ is a great directory. But, don't underestimate the value of being in Yahoo Directory. It is very powerful and I get a ton of traffic to my site through them. I would also suggest NOT paying for any links unless they are going to be on a site like johnchow.com or someone's site that you absolutely know you will value from. In that case those links are going to be very expensive but very worth it. I agree with you IF the ROI is worth it. Depending on how your site is making money, the expensive links may be or may not be worth it. Again, you have to play around with the numbers. Remember, in any industry, ROI (return on investment) needs to be considered. Do you use the Paid Inclusion for the Yahoo Directory? Do you get a lot of human traffic from the listing, and it's also a strong inbound link (dofollow, etc)? I think getting links from high PR pages will do the thing. Guest blogging is a popular way to get one way links and it's even better if you can do it on popular blogs as you'll not only get a back link, but you'll also get a bit of traffic. About #8, as they say content is king. Keep providing great content and people with great links will link back naturally. 1) ADWORDS: I know that Lynn is not using it, but I found that using Adwords does not only bring paid traffic but can also bring you one way links. The reason is that there are still a lot of new websites starting up that start with linking to interesting websites. These new sites start looking in Google and also look at the Adwords results they see. So I would not use Adwords as a 'one way link builder' hahaha .. but it is a nice site effect. 2) FREE directories: Last weekend I did some competitor analysis and found a few PR 4, 5 and 6 directories where you just had to submit your url to and voila, the next day I was added to the directory, for free! It's interesting Richard to see that you could have easily submit to those sites. I would largely like to know how you evaluate the impact of those particular links at the receiving pages of your site and also the traffic to your site in general. I usually outsource directory submissions, but make sure to do that in addition to other valuable link building strategies - for the variation. I really try to seek out small topical, or local directories. The kind people actually use to find related sites - both for the backlink and for the exposure. I never would have thought of text interviews on relevant blogs. Asking a series of questions via email and then posting the questions and answers to your blog just seems so simple. I've also been reading more lately on guest blogging but how do you go about becoming a guest blogger or having guest bloggers to post on your own blog. I find a lot of guest blogging requests on Twitter. I also watch blogs in my niche and keep tabs on what their topics or series are, and make offers on topics I could write for them (with exclusive reprint rights, of course). The example in my post, Danny Cutts guest post here, was perfect as I was in the middle of a content creation series. The talk about the guest post started on Twitter. Simple! i mainly use social bookmarking coz i'm lazy haha but i can see now that there is a lot of other stuff that i should be doing! You definitely need more variation. See this post in the series on Effective Link Building. Thank you for sharing 7 simple tips. I really appreciate this post especially its content. This is really something worth your time. Thanks! Nice Post, as usual! I like your tips for one way link building. Thanks for share list of Social booking sites. I am confuse about Link Exchange or Reciprocal links. can we make link exchange? They still hold some value, but they're not worth near as much as one way links. And it's really difficult to get people to open, much less respond to link exchange requests. When it comes to how I want to spend my time, I go with the methods that give me the highest ROI (return on investment) AND the best links. Thanks for your suggestion, Lynn. I'd like to know what your single favorite link building method is that gives you the highest ROI and the best links. Guest Blogging and Interviews. Because they are easy, it's not boring and mundane, requires very little link-begging (lol) and they provide high quality one-way inbound links. Thank you Lynn for replying. What you've mentioned makes very much sense to me. I've got guest bloggers who write for my blog, but I've not written as a guest author myself. I've got to give it a try! On top of the guest post yesterday (link above) I just did 3 interviews this morning by email to be published on other blogs. Quick & easy - and fun! This is the kind of stuff that made me fall in love with your blog from the beginning. I've been doing the varied approach from commenting, social bookmarking to press releases and I definitely see a difference from sites I've concentrated on one or two only. I'm still in the process of link building. You have given us important ideas in SEO. thanks a lot. Thank you. Very true - this Link Building series actually comes on the heels of my content creation serious, which you'll find in this category: Web Content Development if interested. Thanks so much for this entire series on link building strategies, Lynn. Your tips have been very useful...in fact, today I used one that you posted earlier in the series! I had posted an article on whether content is king a few months ago, then today saw a post from Chris Brogan with a similar title. I quickly went back to my post & made a couple updates, included a trackback to his post, and now I have a link from a top authority that teaches on how to market with social media...which is my niche. 🙂 Yay! Absolutely! You can reach me by email - if you're subscribed to ClickNewz you can reply to any of those and reach me directly. Or it's Lynn@ (this domain dot com). Very smart - that's one of the things I do as well, when I'm writing on a specific topic. It adds relevant resources your readers will enjoy, and the pingback or trackback is highly valuable. Adding outbound links to my posts is a regular habit. Particularly established posts that rank well for my keyword phrase or a very related keyword phrase - as they get a lot of search engine traffic that you'll see trickle into your own post from the pingback. I'm sure this has become old habit for you by now. Sometimes I am still overwhelmed with it all, between trying to write valuable content, then keyword research, relevant images, outbound & inbound links, commenting on other blogs....the list sometimes seems never ending! Thanks for making it simple to follow along and reminding me that it's an ever tweaking process. I know now that I can always go back and optimize my posts as I learn new tricks. Who said you couldn't teach an old dog new tricks?! I'll keep an eye out for that - looking forward to it! Great article. We're always looking for creative ways to generate clean backlinks. One way or reciprocal, we're finding that a few key relevant and related link exchanges (not farms) have boosted PR and SERP results in several key and difficult 2-3 phrase tier 1 placements. Have you found any recent developments on Google "Caffeine" that cause current link building methods/patterns to breakdown? I haven't studied Caffeine very much, but was reading up on their testing earlier this week. It looks like it will roll out after the holidays. I've never thought in interviews, thanks for the tip! Thank you, Lynn. Cool! This is the post I've been waiting for Lynn. Thank you very much! You do not mentioned about dofollow blog comment. I have gain most of backlink by dofollow blog commenting and join in dofollow forum like digital point, v7n etc. Hi Lynn I want to ask one question here that if we put dofollow on our blog comment, so is it effect on our blog PR weight? thanks so much lynn for this post. I have been diligently working on our challenge. Thanks for these great techniques but i still have a doubt in my mind that if we create one way backlinks from a do follow blog, will it boost our PR as well. Of course it will add to your Link Popularity, and if the blog topics are relevant to your link - your Link Reputation as well. Both of which affect your PageRank. Thanks for a great list of backlink solutions. I am very keen to make my website feel like my customers are dealing with a real person, not just an automated salesmachine and so testimonials are really important for our credibility. Also I took a hands-on course on social media through http://www.growyourbiz.co.nz/grow-your-biz-Home.html, and they recommended doing 1 tweet in 4 about your own business or sales and the remainder focussing on other people's businesses and building relationships. Is this the approximate ratio you would use Lynn on Twitter? Would you have any further suggestions about how to succeed with social media comments and rapport building? Thanks Lynn, this is much appreciated. Thanks for the advise and tips on link building. An interviews seems like a pretty neat idea I hadn't considered until now but given the good contextual links you can get I think I'll implement it as well. A good tool for linkbuilding that I use is http://www.analyticsseo.com. It has saved me so much time...I can piggyback the competitors's linkbuilding activity as it compares my performance against them. I thought you and your readers could find it interesting. Thanks for the great information. I especially liked the tips on interviews, testimonials, and social bookmarking. I am relatively new to using social media so your tips are very appreciated. This is a guest post written by me on another blog - a good start for using social media. I want to elaborate on the sixth point - DMOZ Directory. It's well known that we are witnessing a downfall in directory submission quality. All the more so, we should do our best a one way back link from those few topnotch directories such as DMOZ, Best of The Web and Yahoo! Directory. > go for regional categories if your business and website theme permits; increased acceptance rate. That's just about it. 🙂 Hope it helps! I am curious how to add the social bookmark buttons at the end of every post. Can you recommend or is there a WordPress plugin that does this? In your wordpress back office, in the plugins section, click add new and type in the search box "onlywire". I've heard is the best, though I didn't istall it on my blog so far.It also has a paid version but for blog posts is enough the free one. I had mine custom designed, but I am sure you can Google "social bookmarking plugin" and come up with tons of options to choose from. I find social bookmarking quite effective for link building but I wonder it's role in driving traffic. I'd rather like put comments on blogs while reading others' idea and knowledge all in once. And I'm prepared to make interview if you will. We can talked about Indonesian Muslim habits and culture. Thank you. Unfortunately I don't know anything at all about the topic... but thank you! As for social bookmarking, the effectiveness is all about the inbound link and your need for links to get top search engine rankings. Social Bookmarking, in my opinion don't make such a big difference in terms of SEO, rather in driving referral traffic to your website. Thanks for these tips. I am having quite a hard time with forum marketing and finding sites to get links from that are of quality. Any tips for finding sites to get links from in a certain niche, maybe a search phrase that might help. Hey I need some help. Is link exchange acceptable by google. Wont it affect our rank. I submitted my site to dmoz.org more than 4 months still not accepted. Lynn, When you said earlier that you outsource link building, did you mean only for directory submissions? How do you control the quality & number of links that an freelancer does for you? Lynn, great article. I would like to stress the importance of the very last item you mentioned, great content! That is absolutely the best way to get backlinks. Things have changed recently as a result of Google Panda Update against the so-called content farms. So, here's some reluctance about using "article marketing" as another method for one-way link building. High-quality relevant content published on your own site will magnetically draw links - you may want to call it link baiting! I ended up here from some other posts of yours. Whenever I visit your site I just keep reading and reading and reading. I love this site; it's on my list of few sites to visit regularly. What is your view about linkbuilding services such as Linkvana? Are you including such services to avoid as one-way link schemes to avoid? On your recommendation I'm giving guest blogging a go. I've done tons of article marketing and continue doing it, but wish to expand my link variety and I hope to get some of my content in front of more eyeballs. Thanks for all your great info. Top tips there, Lynn - thanks. I never knew about 'testimonials link' until when I read this post. Now. I'll keep it at the back of my mind, for when the opportunity arises. The matter of fact is that link building is one thing that has not dramatically changed. One link building method that will continue to be beneficial for many months and possibly years to come will be blog posts..
You posted this two years ago now, it looks like, but this is all still just as true today. The directory piece and to some extent article directory submissions may not be as relevant, but most stuff here is pretty good. I am working on getting my blog up and doing some guest blogging, I think that would be a good way to get started. Thanks! See: http://www.clicknewz.com/2303/increase-blog-traffic/ for my post on Guest Blogging. I"ve noticed with DMOZ that you should make sure that the category you pick is covered by an editor. Then submit your entry EXACTLY as they request you to do it. Then wait and hope you've picked the right category and editor. Great stuff Lynn. What about Yahoo answers? I know it is a no-follow link but don't search engines like to see a good combination of do-follow and no-follow links? If so, do you or anyone here have any info on what percentages this would be? There's no exact science to it. The best thing to do is to vary your links *naturally* which includes a mix of follow/no-follow, link types, link sources, anchor text, etc. is there be helper to link more from other website ? and one way link is better than reciprocal links ?